Some girls buy shoes. Others buy handbags. I seem to be in the business of collecting beers and they’re taking over my flat! One of the things I love about beer is that there’s no end to the special editions, barrel aging, new hop varieties, new methods…. those creative and clever brewers just keep surprising us which means you could try a new beer every day and never have the same one twice for as long as you live! In fact, you could try more than one every day and never repeat or, like me, you could just come back from the local bottle emporium a couple of times a month laden with clanging bags of beer to pile up with the beer you just bought online and the beer you bought last year but you are saving for a special occasion. On Friday decided to be brave and actually open one of my ‘special’ beers on the train to London It was extra-brave since it was not a breakfast stout, nor had it been anywhere near coffee – a complete change from my usual train beer! 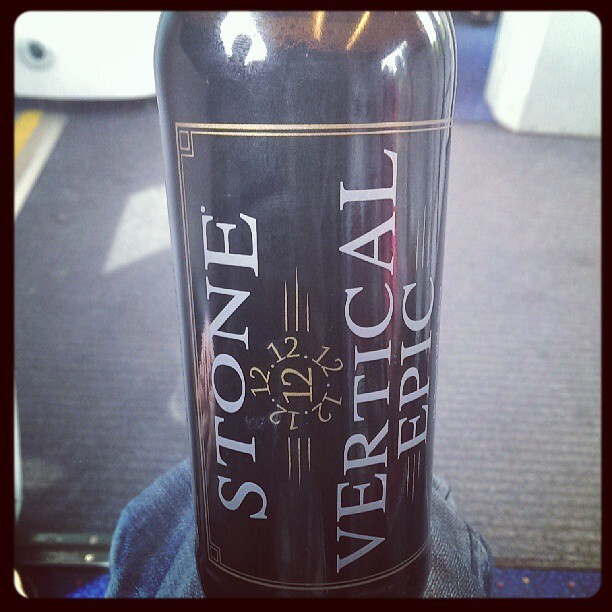 This particular one-off bottle was the final chapter from Stone‘s Vertical Epic series, 12:12. The series started in 2001 with ‘Stone CEO and co-founder Greg Koch suggesting we release a different Belgian-inspired beer suitable for aging each year on the date when the day, month and year registered by the same digit.’ They ended up with a series of 12 epic beers which were designed to be tasted as a set. Sadly I was late to the party so I only had this one bottle which now makes me a little sad because it turned out to be a jaw- dropping amazing Belgian Christmassy ale. I had no appropriate glassware on the train so I had no idea what it looked like but I imagined a dark chai with a garnish of slices of orange and cinnamon sticks. Larger than life, warming, luxurious, very extravagant for a breakfast beer. Maybe it was one to save for a dark and stormy evening with rain pattering against the window. There were massively chewy fruit cake flavors with bitter dried orange, big cloves at the back, not that sweet but really big and beautiful. I haven’t been this impressed by a beer in a while, possibly because I’m hoarding all the best ones.. I can see the Christmasy description. My first thought was a pumpkin like ale lacking any real restraint of the spicing. Like they just dumped the whole fall spice rack into it 🙂 A very good share bottle, but drinking it alone was a bit of a challenge.